We planned and pored over maps, looking for a unique route, where the roads run quiet, the street directory and Strava were of no use. We’ve been toying with an idea and searching for the solution: for a route that was ours, no cars or traffic lights. We wanted a perfect road, what we needed was to go off the road. 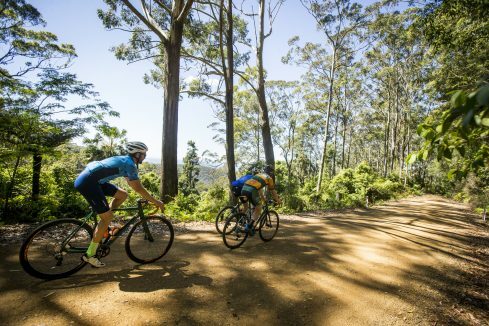 A whole ride hosted within a national park, just two wheels and wilderness, on a mix of tarmac, gravel, fire roads, and four-wheel-drive track, Gravel Grit is exactly as it reads, off-road and possibly a little rough and tough. We’ve been toying with an idea and searching for the solution: for a route that was ours, no cars or traffic lights. 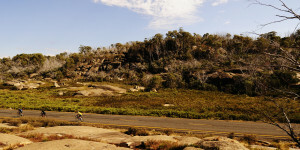 Just north of Newcastle lies the Watagans National Park, nearly 8,000 hectares of bushland over 200 million years old. 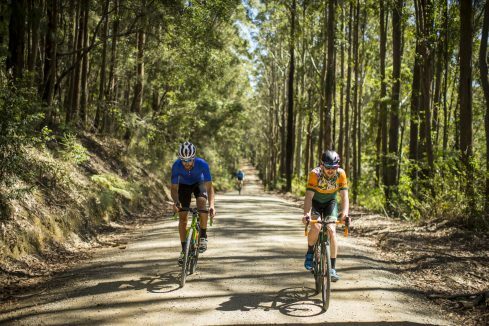 Amongst this are four routes, from 46 to 67 kilometres, of tough climbs and thrilling descents weaving through rainforests, sandstone cliffs, and tall gums. How much grit do you have? The distance and difficulty is dependant on you, the shorter routes are easiest, and the longer are harder, both in fitness and technical ability. 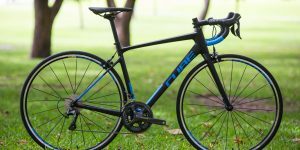 After much of our own trial and error we have a few suggestions; a road bike with wider tyres may survive ‘The Taster’ but if you’re going longer a ‘cross bike or MTB is a must for the rocky descents, and compact gearing for the pinches and steep climbs. Why Gravel Grit? 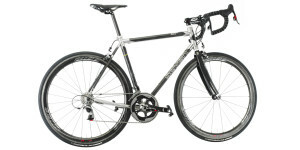 It’s an itch we just can’t scratch, we’ve been pushing our road bikes to the limit and trialling ‘cross bikes, each time delving deeper into roads unknown. ‘Gravel grinding’ makes perfect sense in this country, we can utilise all the seldom used dirt roads and tracks, avoiding the hassles of traffic, whilst being immersed in nature. For the sufferers there’ll always be climbs to find and for the rest there’s still a few healthy doses of speed. Our perfect ride. A ride that doesn’t pit you against the clock, just your own skill and the route itself. Together with Bicycle Network we’ve made our perfect ride. A ride that doesn’t pit you against the clock, just your own skill and the route itself. It’s not a teams race or an amateur re-enactment of a world tour stage, it’s simply getting back to basics – a good day out with like-minded mates with some healthy rivalry and camaraderie. Save the date, Sunday 10 September 2017. We hope to see you there, we’ll be in the Cyclist shirt battered and possibly bruised but definitely smiling. The introduction, combining 16km of tarmac and 30 km of smooth gravel roads. 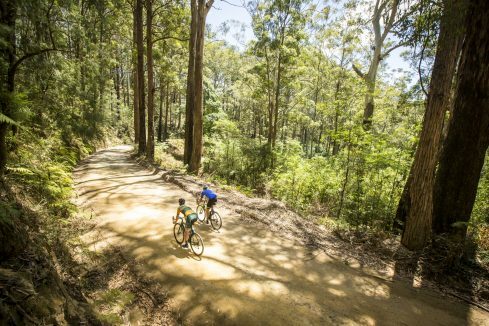 The gravel sections are 2WD appropriate fire road, and rideable on a road bike with 28mm tyres. 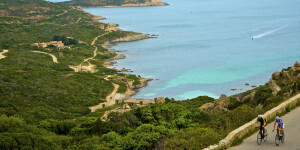 This includes most of the 46km route, with a 12km detour of 4WD fire road and gnarly descents. This loop is not suitable for a road bike. 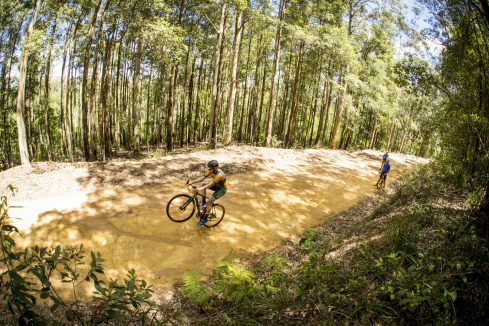 Incorporating most of the 46km route, you’ll head deeper into the wilderness, rough 4WD track, a fair bit of up, and some surprises along the way. 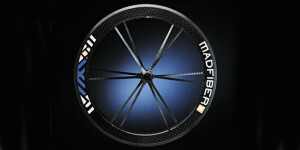 We’d suggest a CX bike or gravel bike with at least 32mm tyres, or a mountain bike. 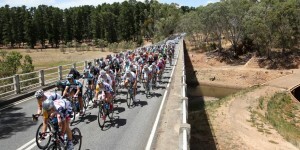 Don’t be fooled by the fact that this is ‘only 67km’ – it’s a true multi-surface adventure and a big day out. Incorporating most of the main loop plus the High Road and Low Road, plus 20km of rough 4WD fire road. Plenty of up, plenty of down, some laughs and some tears. Pack your sense of adventure, and have a couple of extra weet-bix for breakfast. Here’s a peek at the course, that’s all we’re giving away! For the exact details you’ll have to enter and find out, besides it wouldn’t be an adventure if we ruined the surprise. 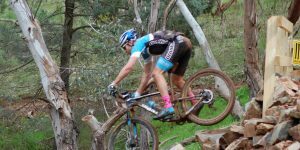 Gravel Grit video – Bicycle Network. For further details and tech tips visit Bicycle Network’s microsite, or if you’ve seen enough Enter Now and receive early bird discounts.